US officials familiar with the situation say that the Trump Administration is likely to announce a dramatic “ramping up” of US involvement in Libya, appointing a new US ambassador, and setting up a permanent US military presence in the nation. While the military operation appears primarily aimed at supporting the “unity government” in Tripoli, officials suggest it might also see some US troops deployed to war-torn Benghazi, currently under the control of a rival faction, with an eye toward eventually uniting the country under unity government rule. President Obama decided to back the unity government during the Sirte offensive, sending US troops to fight ISIS there with the expectation that the unity government’s victory would give them a massive advantage over the rival governments. This has not proven the case, however, with East Libya mostly dominated by the Tobruk parliament and the LNA, and the unity government struggling with the Tripoli parliament over the capital. 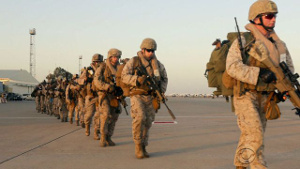 The US officials say that the administration is happy with their increased involvement in Somalia, and is looking to replicate that sudden escalation in Libya, trying to carve out a permanent US presence in the country, and ensure that whoever ends up in power becomes a US client.